Available to Shambhala vajrayana students who have completed Vajrayana Seminary or Sacred World Assembly. Please include the year you attended in the comments section of your order. 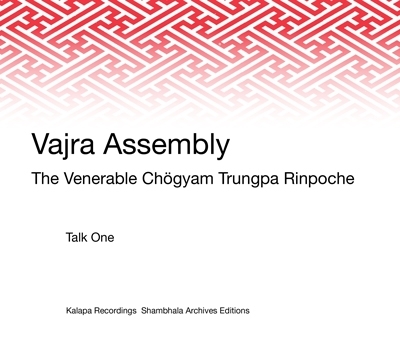 Here are the digitally remastered audios of the three talks Vidyadhara Chögyam Trungpa Rinpoche offered at this Vajra Assembly taught at Dorje Dzong in Boulder, Colorado in 1980. The Vajra Assemblies of the Vidyadhara became his primary teaching vehicle for all tantrikas, following their immersion in the three-month Seminary training. They are transmissional in every sense--essential instructions for bringing the vajrayana to the path and to our daily life. There is no more intimate teaching than the talks given at the vajra assemblies, and, the power of actually hearing these teaching is quite extraordinary. It goes beyond what one can glean from reading these talks in edited form. 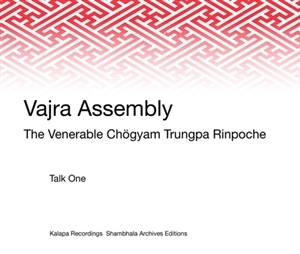 At the same time, putting the two together, by listening to the CDs as well as reading and contemplating chapters from the transcripts, The Collected Vajra Assemblies, can be an extraordinary way to study the Vajrayana teachings of the Vidyadhara.